Vaja iVolution Top: I’ve enjoyed using Vaja cases for my mobile devices for many years now. They are definitely at the pricy end of the spectrum but the leather and the workmanship are absolutely top class, and they feel like a perfect expression of your love for a shiny companion device. This iPad case looks and feels wonderful. 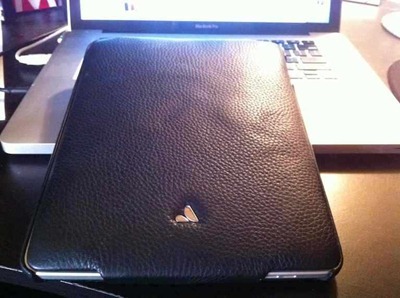 The leather feels superb and it’s a very practical and comfortable case to use. The top is nicely padded leather to protect the iPad screen and is easily detached. The back / bottom fits the iPad like a glove and feels great in the hand. It’s easily my favorite all-round iPad case. Oh, and as with all Vaja cases there are abundant color and general customization options. 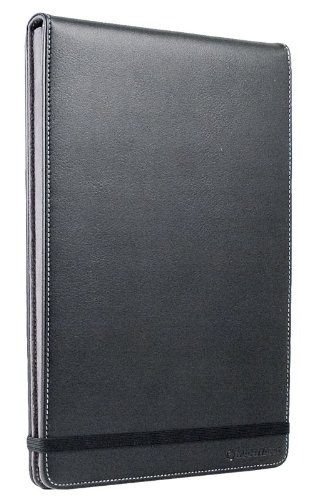 Marware Eco-Flip for iPad: A very versatile case – great for when you’re out and about with the iPad, as it’s professional but not too flashy looking and very comfortable for working with the iPad while in the case. The flip style is nice – and it offers two comfortable stand positions and a secure hand strap. It also has an elastic closure strap. Marware C.E.O. Hybrid: Another versatile workhorse case from Marware – and just a little handsomer than the Eco-Flip. It’s a ‘hybrid’ of a traditional shell case and a padded folio case. Once again, this is a very comfortable one for using the iPad while it’s in the case. Its faux leather exterior is made to look a little like carbon fiber and a couple of good viewing stand angles. Ghost Armor: I stumbled upon these due to an excellent kiosk at the Barton Creek Mall in Austin, Tx – right outside my local Apple Store. These screen protectors offer great protection for front, back, and sides of your iPad, and significantly reduce glare, fingerprints, and smudges on your iPad. The helpful guys at the kiosk did a quick and perfect install for me – and their pricing is very competitive with any of the well-known screen protector brands. They have locations in 18 states so hopefully you can find one near you. If you’re in Austin, definitely check out the guys at Barton Creek. Camera Connection Kit: Apple’s best and closest to essential iPad accessory. It lets you import photos from iPhones, iPod Touches, other iPads, or cameras via its USB adapter, and comes with an SD adapter as well. Apple Wireless Keyboard: There are less expensive and more portable options around - but this is one of the nicest BT keyboards around, pairs easily with the iPad of course, and is very comfortable to use. Mobile Cloth: The iPad is a massive fingerprint and smudge magnet. 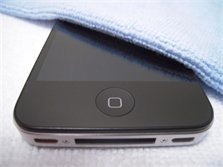 Screen protectors can help make it less so, but the screen still gets grubby looking with day-to-day use. Until recently I thought a cleaning cloth was a cleaning cloth. Until I tried these. They are now an unglamorous but incredibly useful accessory that are somewhere near my iPad whenever possible. 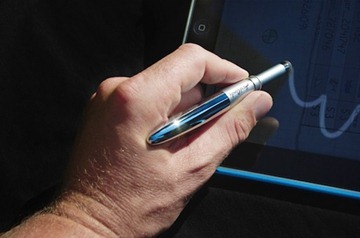 Hard Candy iPad Stylus: There are a few good options for iPad stylii, but this is a favorite for its good looks, weight and because it includes an ink pen on the other end of it (that’s refillable). Just Mobile UpStand for iPad: Solid and great looking on a desk (or anywhere else). 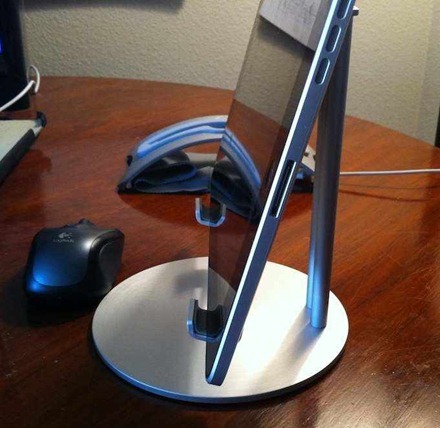 A perfect height for viewing things on the iPad in either orientation – and easy to plug in your charge / sync cable while using it. BookArc for iPad: Another solid and great looking stand for the desk or wherever you like to set your magical device. Holds the iPad very snuggly in both portrait and landscape mode and also leaves plenty of room to plug in your sync charger while in the stand. 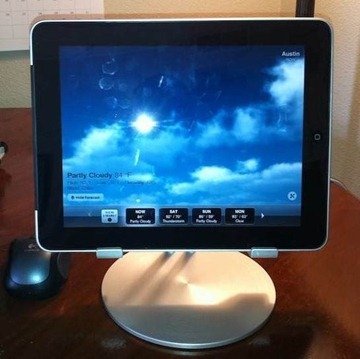 Compass Mobile Stand for iPad: Brilliantly clever lightweight and portable stand for the iPad. The ultimate, compact do-it-all stand for when you’re out and about with the iPad. Folds down to an easily pocketable size and offers a good View mode as well as an excellent Work mode (shown above) that’s ideal for typing. There you go. Those are my favorite iPad accessories. 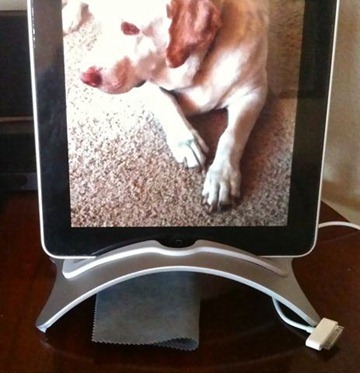 There are a huge array of accessories out there for the iPad – so I’d love to hear about some of yours in the comments. *** Please note: If you use the buy links marked ‘Amazon affiliate link’ in this post, this site will receive a small percentage of the sale. I’ve offered alternate links – to the accessory vendor sites – alongside all of these, so that you may choose whether you’d like to support the site a little if you choose to buy any of these accessories. Magical and wonderful? After a long rss subscription I'm not taking this feed into the new year. I have seven or 8 apple devices in my house but can't stand any more douchey fanboy fawning. Sensitive much? I found the writer's choice of words quite appropriate, given Master Job's iPad introduction. Sorry to hear you're dropping the feed. I honestly feel the iPad is an amazing device. I've done my share of posts criticizing Apple, the App Store etc as well – I don't feel as if I do too much fawning. Do you keep ur iPad naked or is it in a case? I noticed a few pics it was in a case and in others it wasn't. Nearly all the time it's in a case. It snuck out without clothes for a couple of pics, but that's not my habit with it. i thought the article was good and worth my time to read.